Does Twitter Set A Limit To Tweet Updates? Such as a social network without the ability to update status/feeds is boring, so also twitter without the ability to tweet can be annoying, especially when there is more than enough thing to share. But there is some rumor, have you hear about the rumor? That Twitter limits the amount of tweets it's user updates per day. What do you think, is it true? Twitter does set a limit to it's user tweets updates. But do not be quick to run into panic, because the limit can somehow not be considered as a limit, but as a nice way of saying, don't spend to much tweeting when you have more important things to do. Because twitter has no intention of taking over your precious day. So what is the limit? It is 1,000 tweets per day/24 hour. 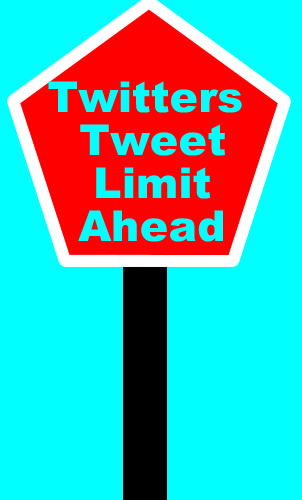 This means that after your 1,000th tweet within a 24 hour period, you will not be able to make another tweet until after that after 24 hour period expires.